Included in your JazzHeaven EDGE Membership! Or buy individually. PLUS: Get YOUR QUESTIONS answered! PLUS: 1-on-1 Feedback by making Participants live via Webcam! So WHO are the Artists...? Every Sunday for the coming 3 months is already BOOKED - and then some! Larry Goldings, Kenny Werner, Jerry Bergonzi, Dave Douglas (tbc), George Colligan, Steve Cardenas, Ben Allison, David Berkman, Brad Allen Williams, Ingrid Jensen, Dave Liebman, Nir Felder, Oz Noy, Dan Weiss, Pablo Held (tbc), Ralph Peterson, Kevin Hays, Vincent Herring. Marc Copland, Matt Pierson, Matt Wilson, Dena DeRose. PLEASE NOTE: the fact that the current artist roster for our upcoming webinars is almost exclusively comprised of white males is simply a reflection of the artists who responded to our invitation to participate. We fully embrace DIVERSITY and have contacted and are in conversation with many more artists, incl. fantastic female artists and artists of other ethnicities and we are looking forward to booking dates with many of them the sooner the better! NOTE: unless specified, each webinar's topic is designed for ALL instruments! April 21: Kenny Werner: Effortless Mastery: Ask Kenny Anything... Plus 1-on-1 HOT SEATS! "Anything" as in related to Effortless Mastery. His book and his 2 JazzHeaven Videos on it. This one will be a GOLD MINE for you if you read his famous book OR have one of our two rather incredible Effortless Mastery videos with Kenny. REPLAY OF WEBINAR available soon. => You can purchase access for ONLY the upcoming JERRY BERGONZI live webinar on Sunday, April 28 HERE SOON. David's fantastic book has pretty much only 5-star reviews on Amazon. Professor at The New School in NYC. June 30: Nir Felder & Oz Noy: topic to be confirmed; OR: "Ask Them Anything!" ​It's gonna be a fun hang... AND super-informative! NY Times: "one of the top five jazz drummers"
And his latest band features Craig Taborn & Ben Monder. You shall be in good hands. So What's Next? How much? How do I get Access? See section below this one for buying access to 1 SINGLE webinar. 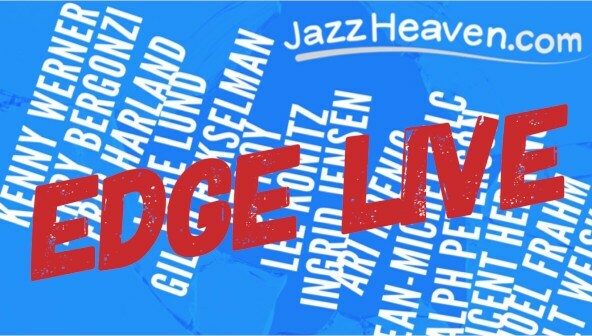 Join the 3-DAY FREE TRIAL of our JazzHeaven EDGE Membership. Including any LIVE WEBINAR that happens during those 3 days! And you could cancel with 1 click. And you won't be charged a dime if you cancel on day 1, day 2 or day 3. As long as you are a current JazzHeaven EDGE member. and on MANY different topics. AND to get YOUR QUESTIONS answered - from the masters! PLUS: the opportunity for YOU to be LIVE ON SCREEN right next to them (via your webcam, just like SKYPE) and get direct 1-on-1 FEEDBACK on your questions & YOUR PLAYING! Can I also just buy 1 single Webinar Access? All versions which include RECORDINGS will be available only later on, once we confirmed the webinar recording came out well. => You can purchase access for ONLY the upcoming JERRY BERGONZI live webinar on Sunday, April 28 ​HERE SOON.